Nullcon 2016, http://nullcon.net/website/nullcon-2016/cfp.php is a premiere security conference held each year in India. Training’s, booths, networking parties, awards, talks, hacking challenges and a lot more makes this conference. What attracts me the most is the creative badges at Nullcon, so well thought and made they totally stand out as a USP to the conference. the conference and are curious to the know the Badge for the year. With the preceding years badges made on a floppy drive and with Red Hat being the sponsor and being informed about the badge making process , the first thing Red Hat wanted to know is to see the badge come up so well to beat the precedence set by the previous year. This years anticipated turnout was of 800 delegates and they merrily carried the glittering badges around and took them back as a memory ! It was a sense of pride to feel the happiness People has with the badges. The badges were accurate timely made with other details of the attendee and the QR Code. Red hat also had a booth at the conference and was a genuine effort by the Red Hatters to open a dialogue with the visitors on the emerging technologies by Red Hat like Openshift, OpenStack and Red Hat cloudforms and the security aspects. Prasad Mukhedkar from the emerging technologies team in Red Hat pune did an exceptional job here by taking questions from people on the emerging technologies for people wanted to know even more he went ahead and did a small session on cloud forms security at the booth itself. It was so interesting that people came back again after they came to know from their friends about the session. We drew this idea from the “poster sessions” at PyCon India just that we used more live forms like an LED to demonstrate in detail. Since the conference has more ethical hackers and information security people we thought we should create a gimmick at the booth to draw people’s attention to the product security general knowledge and recent happening around it which made news.. So we had our product security guy, Prasad Pandit who designed a small quiz and we ran the quiz at the booth to distribute some cool swags for people who got it right. It was a great time people literally scratching heads and raising hands to answer, the result was in no time we had interested folks turning up at the booth to take the quiz. What we saw were some contented faces at the booth after they won the goodies. It was interesting point to note that people came to Red Hat’s booth just to say that I am your customer and you guys are doing a great job. There were students inquiring about some internship openings. There also were some security architects who wanted to know more about the product security and hence left their contacts with us. This is precisely what makes you feel so passionate about the place you work for ! Prasad Pandit also spoke about the Fedora Spin available for security as the ready tool for people who use Fedora or had interest to use them so we had some Fedora 23 DVD’s at the booth given out to people. There were some interesting sponsors with booth presence like Synack, Checkrmax ( scan un-compiled code), Sans (information security training & certification) Superhero ( for middleware security). “Great places are where great people meet” such was the site at MIT college Pune from 26 to 28 th June where the yearly FUDCon APAC chapter was conducted. The aspiration to host and organise the conference came true when Pune was officially announced as the venue for the APAC conference. All thanks to a detailed and promising bid by the organisers. The organisation and planning of the event started from the CFP and the website, which was going to be the place people to watch for the most sought after event in open source. It took us a good 3 months of effort for the CFP to be live and eventually more intense efforts towards outreach on CFP. We did a fair enough job on that justified by the number of talk submission we received with a reasonable good number of 140 talk submissions. The CFP planned to close by 9th March got extended by a few more days. The budget estimates were based on the repositories from the the FUDCon 2011 handled by more or less the same organisers with room for inflated travel rates (web fares) and real time experiences from recent events. The organising team also sought help from Red Hat, Pune as financial sponsors. The estimated vis a vis the actual closed within the budget. MIT college sponsored the wifi. Hasgeek and Sanisoft came in as angel sponsors when the organisers needed them the most. The planning was fairly around head like- Travel, Accommodation,venue, Outreach , FUD-Pub,Swags and collaterals and conveyance.To save on the burden for associates to pay and expense later we used the existing vendor base for bill to company and some awesome negotiated rates. Vendors who did a splendid and a professional job were Creation Magnifique for T shirts and socks, Country wide travel for local and airport conveyance, Cocoon magarpatta hospitality for accommodation and BLUO for the FUDPub and Food delight for the lunch. An awesome conference happens when you manage to have few volunteer who have these niche vendor management skills. The key to that to have overestimated deadlines for the finish. A learning to have prioritised swags over all makes a difference in the last few days of planning. Talk selectors realised there were a number of talks on Docker/atomic , storage and OpenStack which warranted a series of separate talks which we called as tracks for better management and audience understanding. And thus we had 3 technical tracks, one bar camp track, a track for BOF. and two main talk tracks. Talk selection were done and published and travel sponsorships were being approved soon after that. The sponsorship were more based on the criteria of active contributors to Fedora than on the basis of being a speaker. The tickets were thoroughly looked at and travel sponsorships partial or total were done. The travel consumed 30- 35% of the total budget. 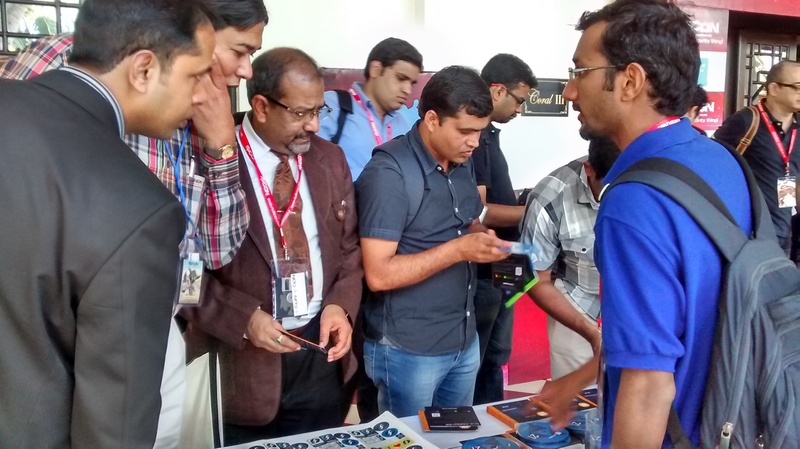 Fedora Booth was mostly manned by Sankarshan Mukhopadhyay and Prasad Pandit. The talks ran smoothly except for a few glitches in the wifi which were mainly due to changes in the firewall settings which created confusion for a while. Apart form that the BOF’s were mostly used for the fedora ambassadors meeting and Bar camps had limited entries which did not use the whole conference day. FUD-PUB- the networking event was an awesome place with all that one can expert as perfect setting including bowling alley, foos ball, pool, karaoke, drinks a dance floor and not to forget the awesome food !! The last day of the conference was mostly workshop and got over with a closing note which detailed the active volunteers, the journey from bid to bid adieu from glitches to milestones and to watch for’s in the coming days. The next FUDCon venue is in discussion. And last but not the least, a community grows flourishes with its members and more so with the ambassadors who act as crusaders of the technology in specific and community engagement in general. Conferences like these are aimed at increasing awareness, collaborating on technology platforms and sharing through community work. Coming together is either the first step towards building a community or holding hands and pursuing the goals of a successful institution. An event is successful by not just the smiles its captures or the pats it receives but more from the culture its brings or passion it encourages in the future!! Nullcon : A great conference experience ! 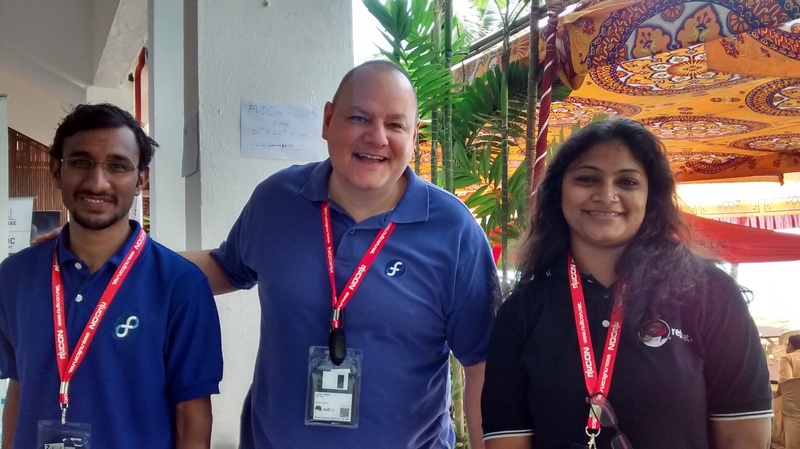 I , Praveen Kumar, Soni Lonari and Prasad Mukhedkar on behalf of Red Hat got to attend Nullcon 2015. Red Hat also was a badge sponsor. The idea of nullcon was generated from null – The open security community registered not for profit society.. nullcon is functional since 2010 usually structured as exhibition, talks, security trainings, workshops, bugbash and job fairs. Nullcon 2015 was conducted at the Bogmallo resort in Goa. A perfect place selected with solitude which allowed a lot of networking opportunity and an experience to remember. 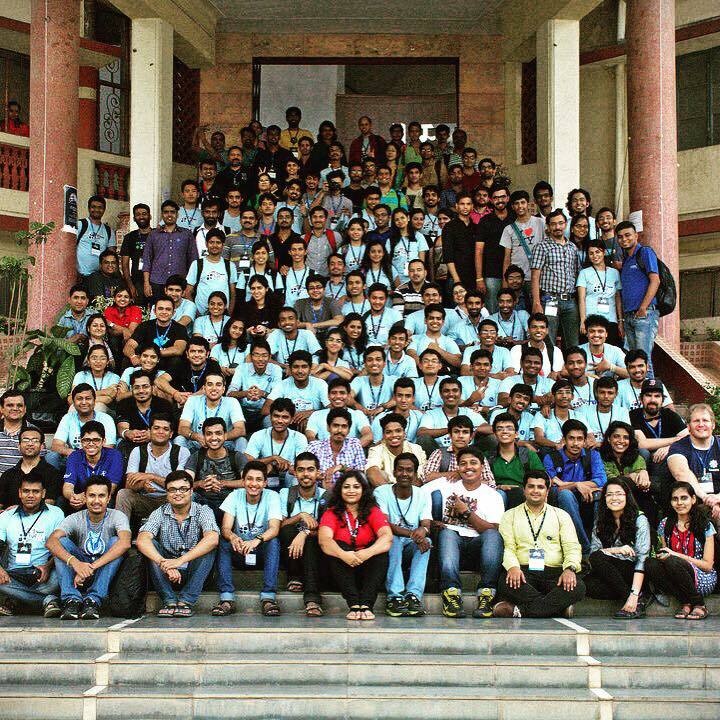 Nullcon 2015 was a five day effort which included 2 days of training and 3 days of conference. Indeed a very extensive and a well planned training and conference style. Red Hat was given a table space as a booth and we reached on the 6th Feb. The registration was very well managed with pre- made badges which had a floppy drive as Nullcon is known for geeky and innovative badge ideas. The best part was the swag sling which left smiles on attendees as they slowly pulled out the swags with curiosity. The handout made by Nullcon was detailed and had insights on all the speakers with their bio’s. It was interesting to read through the CXO corner and it was quite resonating to see Harish Pillay from Red Hat there. It was all the more enriching to see him on the panel discussion. However there was clash with Rahul Sasi’s session which left people to make a difficult choice to attend. Networking: On this conference my networking experience was splendid and the venue was so apt for it. A sea facing sit out along a pool side couldn’t get better for the purpose. Few interesting people I met were Joerge Simon who was a fedorian and was one of the trainers who took 2 day training on coral 2. He is so collaborating and enthusiastic that he can bring the best out in others in no time. Had great discussion with him on Fedora, Upcoming FUDCon 2015 in Pune, his experiences with his visits in India and how he was so curious to know about so many cultural aspects. Another such meet was with Harish pillay who is a Red Hatter but I met him for the first time and it was so nice to see his zeal on almost everything be it I python, or CTF for women by info-sec girls, for that matter upcoming FUDCon 2015. Looking forward to meet him there. Another interesting group of ladies were who have recently formed Infosec girls an initiative to increase women in information security. Sneha Rajguru Shruti Kamat and Anupama Giri are doing a nice job on this initiative. The organizers had a nice invite only networking party arranged at the venue followed by a JAZZ band the next day leaving the attendees all the more relaxed to grasp more the next day. Cut Throat Highlight: was the emc defenders league which had a cash prize of INR 5,00,00 and Winja ( CTF by women for women). We have been hearing about a lot of women in open source initiatives and endeavors happening all across the world. There have been mailing lists, women centric conferences events,awards and meet ups. There have been debates, brainstormings on the need for such women centric initiatives. The underlying basis comes from the fact that the women represent only 2 percent of the total open source population. One such group is “Pyladies” which is an international mentoring group aimed at increasing the participation of women in the python open source community. Recently I got in touch with the Pyladies US team to know how we could participate or co organize a pyladies event since encouraging women to open source and technology is a mutual goal across. This helped us understand that there were pyladies volunteers Manali Gadre and Shreya Bhattacharya from Cummins college of engineering. And that’s how we planned our first event at the campus. Thank you girls, you were splendid. 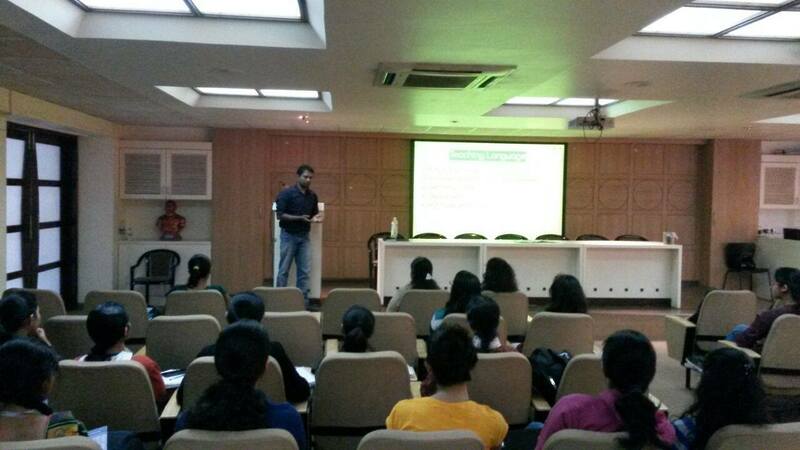 The event started with the introduction to PyLadies by Anisha Narang. Ramakrishna Reddy caught the nerve of the audience by introducing Python and its evolution as a programming language . Students were interested to know how the language evolved with the internet and how a completely unknown or nontechnical person could learn this language with ease. He quoted Late Kenneth Gonsalves an open source enthusiast and as someone who learnt Python at a later age and yet contributed so much to the community. The sure takeaway for students was when Ramakrishna gave them a few tips to be efficient at the language while choosing Python as a career Viz.Understanding memory consumption, data structures, algorithms, Core OS skills, Putting codes on internet for companies they wish to work for and getting statistics and probability as helpers to drive the programing language. He also asked the PyLadies to know and learn more about API’s. An excellent piece of advice that came from Ramakrishna was when he encouraged students to intend to be good programmers and not just to fetch jobs. Ramakrishna also hinted a few career options in fields like Big Data, Animation defense. And while doing so he also cited the example of the animation Movie Kunfu Panda which used python and did problem solving through virtualization. 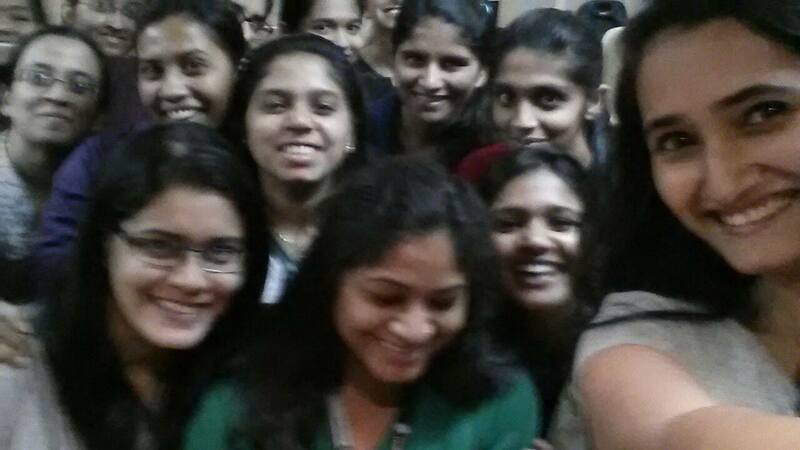 PyLadies nodded in appreciation to the well covered aspects of python in the industry by Ramakrishna. Praveen Kumar and Chandan Kumar added real life to the event when they actually undertook hands on workshop by starting with simple programs like hello world, addition subtraction through python interpreter to a brief covered by Praveen Kumar about functions, file handling, exceptions, class and modules in python with basic examples.Anshul gave a demo about fetching data from rotten tomato’s API using python request module which was equally interesting.They carried Fedora system live DvDs for the hands on. Thank you Siddhesh Poyarekar for making these available for us ! Long way to go ladies ! Yes we are talking about Womanhood and the identity of her existence, perspectives of her own, the patriarchal hand cuffs which deny her a free hand to live as a human being and her right to be treated as one. No this isn’t intended to be an activists blog, but its intended to write about a form, a structure, a movement, a style, a feeling and lastly with more emphasis, an initiative called “Ada” . ADA was founded in Jan 2011 and is a non profit feminist organization aimed at increasing and leading women participation in open technology and open culture. For now its well understood the important role of women not just in building society but as key contributors to development and technology. Thats where we are women in open technology and culture. The focus areas for ADA are: increasing women percentage in Open technology which is sadly 2% now, anti harassment policy on conducting conferences which is gained momentum and used in other conferences too, teaching ally skills workshops to all gender to help women in open tech ,with over 2 million people trained so far and the most sought after conference by any women in Open technology the ADA camp. This year there were 3 conferences hosted at Portland (Oregan), Berlin (Germany), Bangalore (India.) Probably some good karma landed me at the ADA camp Bangalore and as a Red Hatter allowed me to me to be a venue host for the camp. 22nd and 23rd Nov, a warm Red Hat board welcomed the delegates to the first ADA camp in Asia at the Red Hat Bangalore office. It succeeded a cordial dinner reception on 21st Nov Friday.A lot of women struck conversations over dinner and were already charged for the “unconference style” sessions to follow for the next 2 days. The first session however was scheduled on the “Imposter Syndrome” which was very well put up and raised curiosity among attendees. Some great work by ADA on that : http://adainitiative.org/what-we-do/impostor-syndrome-training/. Meanwhile the participants were asked to submit lightening talks for the day with not more than 90 seconds to deliver and one slide to present. Post Lunch sessions started with the lightening talks and the actual execution of schedule for the Unconference style started. Attendees proposed talks and the remaining marked the session which they’d like to listen. There were four sessions slots scheduled for the next 1 day with half a day reserved on the last day to be used for hand on or workshops. There were four session running parallely at each of these slots and the participants could be on and off as per their topics of interest. Thats again a fantastic testimony to being Open and respecting choices with freedom.The best part was each session had a moderator a gatekeeper a time keeper and a note taker. Session notes were circulated to attendees for participants who could attend all the parallel sessions. Few key sessions covered were : Introduction to Information Security, Design 101, Using technology and feminism for empowerment in local community, gender violence online problems and strategy,Castism and racism in Indian Open stuff, Augmented reality big data, why open geo maps are better than google maps, Hacker school, OPW and GSOC, Women in Mozilla, Contributing to Open source projects. Such content rich and open discussions sparked and ignited more passion of being a woman in the open source technology. Some awesome lightening talks included: Technology and gender based violence,How I am in Open Source,WFS India,eTekkatho Digitial Library Myanmar,Ubiquitous Computing,Feministic approach to technology,Diaspora. The best part was 90 seconds to be fair to the topic covered was a test to the speaker and all went good! 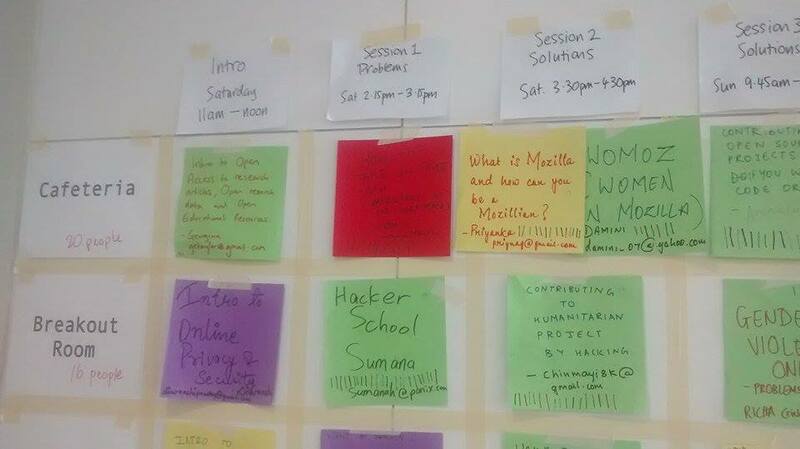 And some enriching workshops on: Digital Security,Open Hardware, Mozilla Web-maker and a crafts workshop too! It was hard to believe that a completely unscheduled conference had such an awesome program made by the attendees in just 30 minutes. Nothing could be more open and encouraging than this. Kudos to Alex Bailey and Sukhi from ADA to drive the wonderful unconference schedule with such perfection that it looked superbly planned. I am sure the attendees would drive such unconference sessions in their communities once they hit back. Some very thoughtful things in the entire conference were the wall of compliments, a clear passage marked in case of emergency in the conference room, photography consent through forms and lanyards, a handmade schedule on the wall, the time keeping for lightening talks, the quite room for resonating what you just learnt, session notes, and the informal group dinners, timely delicious snacks and food breaks,an ADA alumni list, regular housekeeping announcements and off course the swags:). All put together was a unique ADAian experience. 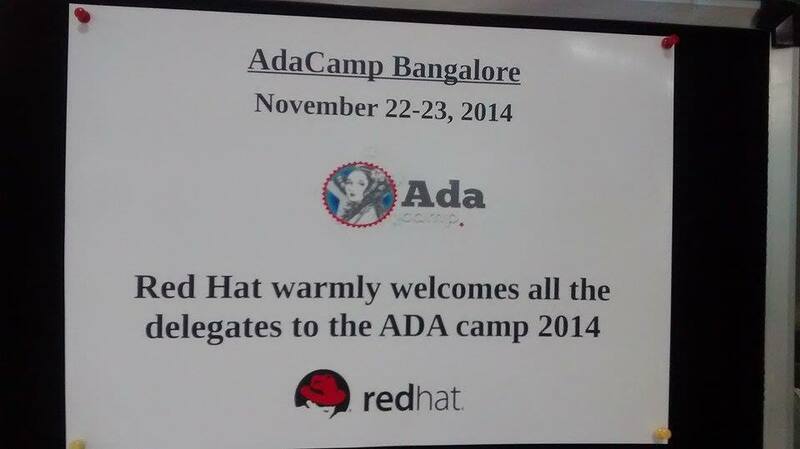 On Behalf of Red Hat I thank ADA camp organizers for considering to host the first ADA camp in Asia @ Red Hat. Red Hat is more than happy to support the cause of encouraging women in Open source. The Women’s Leadership community at Red Hat also encourages the participation of Women in Open Source and has launched a Women in Open source award from 2014: http://www.redhat.com/en/about/women-in-open-source. Please nominate and pass on the baton. I can say this conference was the most truly touched feminist endeavor I have ever witnessed or thought of. An inspiration to last through. Long live the cause and great is & would be the result. Sadly, woman in a Driver’s Seat (Literally) is perceived as a suicide bomber ready to pull the pin at any unpredictable moment. Whether you ride a two wheeler or you drive any of those SUV’s how many of you face a disgusting look from those men who consider roads as their field and love to see women only on their left or probably using the front mirror to apply her lipstick? And when you are just about to scratch your car because a rowdy teenager just gives you a cut so close to miss a breath.You stop your car to avoid a collide to save the two wheeler all you get are sarcastic smiles, disgusting gestures and honks so loud to scare you. And not to forget ladies a few of them would definitely overtake you just to give you that look which say “Hey there.. you are a woman and you cant drive.” !! What made me write this blog is a short Bengaluru -Pune flight. I hate the take offs and landings as any one of you there and to spill a bean I even hold the chair arm rests so tight to counteract the reactions in my stomach. Apparently this was the smoothest flight so far and the on and off from the run way were too smooth to believe. I thought if I get a little glimpse of the captain of the flight I would definitely thank “him” for a smooth flight. Now look at the way we Women have been trained that we imagine a good ride as a male driving product.. naturally.Well hang on I wasn’t right , this time it was lady. How I wish I could remember her name and follow her on some social site!. Why are women so underrated as drivers.. here is my take. Societal drift : In India I grew as a child where my mom used to rest her hand on my dad’s shoulder while he rode our Bajaj Scooter for 12 years. How much pride a man gets when his lady sits behind him where her hand also signifies the fact that “Yes I am dependent on you”. As against now where women drive those Enfields and HD’s to the highest motor-able roads and they look so super good. A little difficult to digest isn’t it? The dependency has gone! Assaults on ego’s are too hard to take.Times have changed, so should our perceptions guys. Please get habituated for some more jazzy looking women drivers. The Feminine Side: As Women patience and modesty comes naturally to us and we exhibit the same on roads. We don’t pop our heads off the window to abuse someone.We don’t want to run the car on the fifth gear just because we see a 30 or so meter patch empty ahead of us. We would like to go slow and steady, but beware there are these Schumachers behind you who feel you are insane to go with that speed and what an achievement if they overtake you “Applaud”. And yes he wouldn’t miss to give you that look! And mind well guys we would not like to give you way just because you want to ride at a high speed on a congested road. And I really don’t care about that look. Chivalry Are you there ?? Our society thinks a chivalrist by default is a gentleman. Too Judgmental tough..Where does the chivalry go when men see’s a female driver trying to cross a road on a high traffic zone and she struggles to reach the other side. The moment they see its a female driver instead of just slowing down and letting her go they would use all the power to stand on the accelerator just to make sure you don’t get a chance at all. I have seen so many times where I am in a line of cars going across and just when they are able to see you are a female they start from their end too. Get some heart dude! If you can vacate a chair for her why cant you let her go on the road ? Female as Jugglers: A man leaves office at around 8pm just to reach home, get some shower read the newspaper or watch some news, eat and off to bed (exceptions are welcomed here)!! As against a woman who leaves office round about the same time and what does she have lined up? Pick up the baby from day care, pick some grocery on the way (not to forget the quest for parking at each time. ), go home cook, look at the kids homework, get things up for the next day, serve, eat ,clean keep everything ready. Just imagine the temperament with which she drives, not to justify any incidences of mis drivings but to know the turmoil in her mind and heart. Brotherhood: One women goes wrong on the road and there are so many men who join in, why not they are brothers man. And where is our sisterhood fading out ? Next time you see a girl quarreling with some one or stuck please stop by and let her know she need not freak out , Lady is a personified virtue of strength.This isn’t a gender battle its more about transitioning change. There are king’s on the roads and prince too.. Let there be a queen whose given a judgment on her driving skills and not on her gender. Driving skills are not gender based and hence should not be gender biased. You want to rate a driver please first see if there is a “L” on the rear, if the car is too old to be raised, if there are other people who are trying to push you, if there is traffic, if there are these High dipper driver from the other sides,if the right signals were given, if the roads are in a good condition and if she applies urgent brakes at least try to see why she did that and what you need not see is, whether the driver’s seat is filled by a male or female. You need not see that to make a judgement. Equality doesn’t come from reservations it comes from your thoughts.